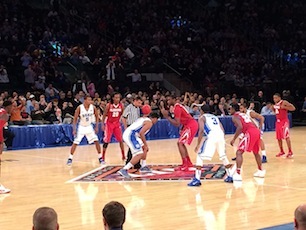 Alabama alumni converged the World's Most Famous Arena to see the Tide take on Duke and Drexel. NEW YORK -- Greater New York Chapter members donned their Alabama apparel for some holiday hoops at Madison Square Garden to see the Crimson Tide men's basketball team battled Duke and Drexel in the 2013 NIT Season Tip-Off. UANYC was out in support for both games and gathered with Alabama alumni before the games at American Whiskey as Alabama fell to Duke in one semifinal the day before Thanksgiving and dropped a triple-overtime heartbreaker to Drexel in the consolation game two days later.